I just spent my weekend doing what I love more than almost anything: creating a piece of art that inspired wonder and joy in the people who saw it. 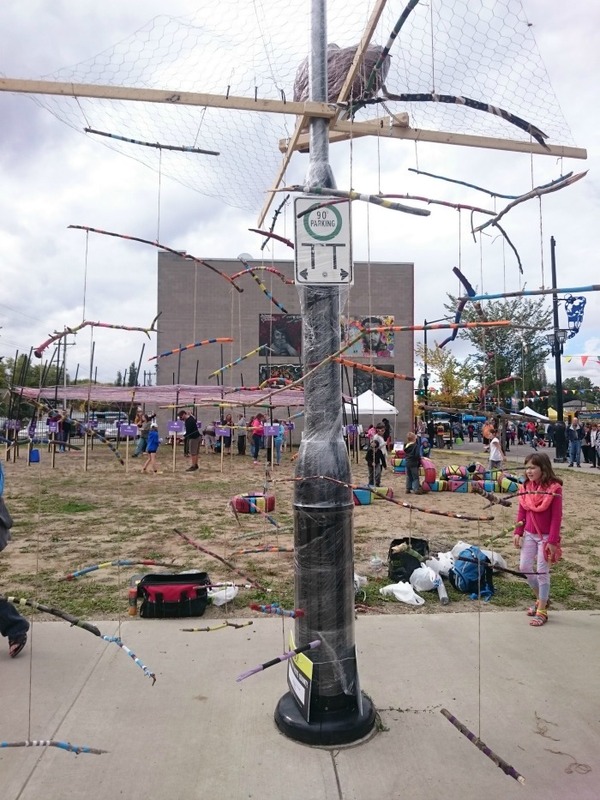 I worked with my friend, Kristi Gurski, to create an art installation on a lamppost as part of Kaleido Family Arts Festival's '24-Hour Deck Out a Lamppost Competition.' It was a lot of work but I was so happy with how it turned out and I would do it all again to see the way peoples' faces lit up when they caught sight of it. Last year I wrote about Kaleido Festival and how much I love the lamppost installations that artists do every year. It's wonderful to see what artists do with such specific constraints, and how much the installations help to transform the festival grounds into something magical and unexpected. Since I was working for the festival, last year I threw together a quick installation but this year I decided to do it right. I asked Kristi, who has done two lamppost installations in the past, to join me and was so glad that she said yes. Read on to learn about how we came up with our ideas, how we put it together, and what I learned in the process. It's been a long time since I worked with another person on a project (not since my set design days in university!) so I was a bit nervous about the collaborative process but it went even more smoothly than I could have hoped. We both seemed to have a spirit of exploration and weren't afraid to say 'Yes!' to the other person's ideas, even if they changed repeatedly. We tried things, and when they didn't work, we tried something else and didn't get hung up on anything. It was a huge relief to have someone to share the workload with, and to trust that the work would get done. We had a few rough patches, but it was always a problem of supplies or construction, and never an interpersonal one. This collaboration reminded me of how wonderful it can be to work with someone else who is on the same page. I was grateful for the support, the ideas, and the extra pair of hands. I know I couldn't have made anything quite so lovely working on my own. After a few workarounds, the structure went up, and stayed up. 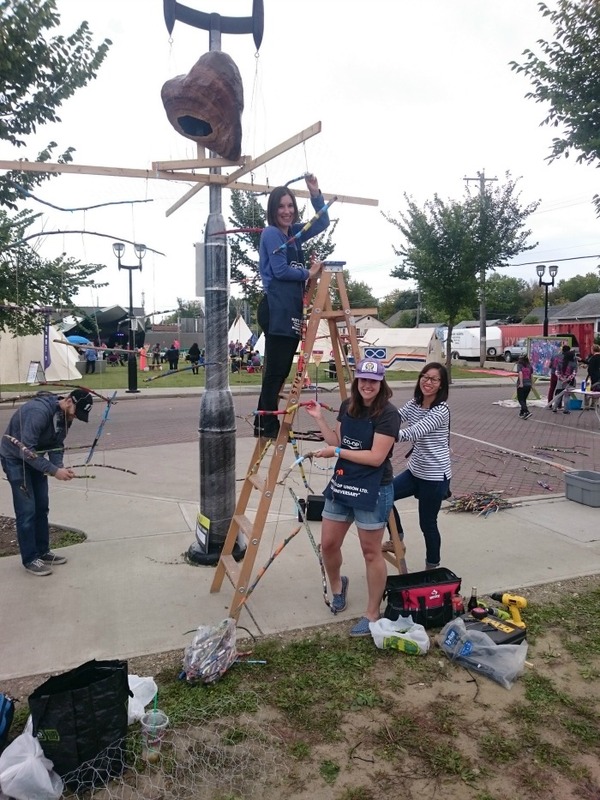 We also got a ton of help from Matt, who designed and built the structure that held our artwork on the lamppost. He was very patient when it turned out that our measurements had been wrong and he had to make adjustments on the fly and we couldn't have done what we did without his help. Finally, plenty of friends and family helped us paint the sticks that made up the mobile. I hosted a stick-painting party (a friend told me that I host the most unique social gatherings) and Kristi joked that she had set up a sweat-shop at her house. 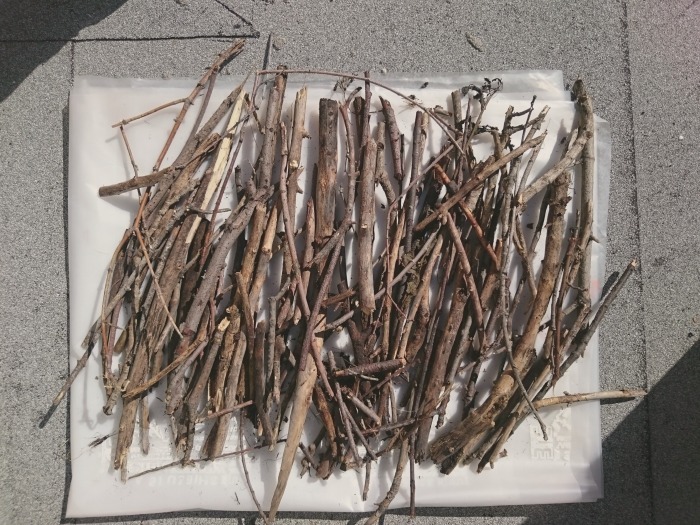 We ended up collecting way more sticks than we could use and were sad that they didn't all get included. If you're in the market for painted sticks (they can be used to make mobiles or to hang jewelry, among other things) we have bags of them in Kristi's shed. Let me know! I would love to say that we had a grand vision that steered our every decision, but that just wasn't the case. We figured it out entirely as we went along, with our ideas building off one another and evolving as we went. I was important to us that our installation be at least somewhat interactive, colourful, and using recycled materials wherever possible. The Reuse Centre is a great resource here in town, where people can donate all kinds of stuff—pie plates, binders, magazines, photographs, fabric, sewing patterns, and soooooo much more—that would normally end up in landfills but instead gets put towards crafty projects. We were hoping to source most of our supplies from there. We started with the theme of the festival, which was "Fill your heart." The first image that came to mind was a mobile filled with hearts. I loved the mobile idea but thought that we could be a little less literal. After making a Pinterest board for inspiration and thinking about what fills my heart, I suggested we use a nature theme. The design that we submitted was of a mobile with nature symbols made from scavenged objects, with a giant paper mache heart sitting on top that would have images flowing out from it. After visiting the Reuse Centre, however, we weren't feeling very inspired on the nature front. We did find a pile of old slides, though, and Kristi started thinking about how they would look hanging with sunlight shining through them, and the nostalgic feelings they would stir up. I loved the idea and for a moment we thought we would just fill the whole thing with slides, until we realized that we couldn't find any more. This led us to our final idea, which was to seek out lots of different kinds of "memories" that would evoke feelings similar to the slides. I dug through some boxes that I've been dragging around with me for a few decades and found piles of letters and postcards that we packaged in reused binder sleeves. Meanwhile, we constructed the heart out of chicken wire and paper mache and were trying to decide how to paint it. We settled on painting it to look like wood since that would help tie in with the natural elements, like the sticks. We were worried about not having enough objects to fill the space (which we ended up being quite wrong about) so we also thought about making chains of fallen leaves, which would unite our "tree" theme. When that didn't pan out, Kristi started collecting acorns in her backyard and painting them—I couldn't get over how cute they were. We glued them to twine to make chains and cut up some old nature photos into leaf shapes and made chains of those as well. Finally, we were ready to install and we had a name for our project, "Memory Tree." We started the installation of the piece on Saturday morning. Once the structure was up we started hanging chains of sticks. It took us a few tries and some help from another structurally-minded friend to figure out how to make the sticks hang like a mobile, but my goodness they looked pretty once we finally figured it out. They spun gently and caught a lot of attention from festival goers. From there we started hanging our artifacts and our chains of slides, acorns, and photos. I had left part of the chicken wire frame inside the heart accessible so that we could tie chains to it and let them spill out. As we worked people came up and read the letters and postcards and it was amazing watching people interact with the installation. My biggest regret is not taking any pictures of people as they looked at the artifacts. We spent about 9 hours on it on Saturday and came back to add more stuff on Sunday morning. Sadly, it was super windy on Sunday so we lost a lot of the gentle spinning as the wind gusted and shook the whole thing. We lost a few artifacts overnight but were happy to see that most of it was still there in the morning! Sunday afternoon the judges came by to decide on a winner. We spoke to some of them and they seemed quite mesmerized. They ended up giving us the Grand Prize, which was never really the goal but sure was a nice bonus. What it looked like when we called it quits Sunday morning - so windy! Collaboration is amazing and I can't wait to do more. Make sure your measurements are accurate. Painting sticks is really fun. Acorns and slides and sticks can make beautiful, Pinterest-worthy decorations. Mobiles are all about balance, which is pretty simple once you get the hang of it, even with multiple levels and extra objects.